The question of English continues to puzzle India and Indians even after six decades of independence from the English. Every academic year, every government in Karnataka (and elsewhere) ties itself up in knots on just when or whether English should be introduced into the syllabuses of students. Buddhijeevis like the novelist U.R. Anantha Murthy argue that a child must speak and learn exclusively in her mother tongue until she enters high school lest she become totally disconnected from her social and spiritual roots. Dalit activists suggest that the promotion of Kannada is an upper-class ploy to keep them away from the fruits of modern learning. While we continue to look at speaking English merely through the prism of power, privilege and livelihood, there is yet another dimension to it, as Sunaad Raghuram discovers in the former British colony of Hong Kong. As the Jet Airways Boeing 777 began to activate its ailerons in sight of the Hong Kong International airport by the South China Sea, and heaved its gargantuan body sideways, aligning its pudgy nose with the dark grey of the runway in the distance, I peered groggily out of the window to see the lazy bobbing of fishing boats in the haze covered morning, with the October sun still haven’t woken up. Out of the swank, squeaky clean airport which seemed to have halls large enough to house an assortment of aircrafts within their own expansiveness, I approached an elderly man and asked him the way to the taxi stand. Even as I wondered if it was one of those things that I spoke to that one man in the vicinity who incidentally did not speak English, I noticed a line of red taxis, all Toyota Crowns. Hailing one of them, I pushed my baggage into the rear of the car and sat down next to the driver and said, ‘Hi, good morning. Let’s go the Harbour Plaza Hotel, Tokwawan’. The ease with which I threw the hotel’s name at him, I thought, would give him the impression that I was one of those travellers whose trip to Hong Kong was perhaps the 17th! The taxi driver looked at me, smiled a weak smile and didn’t do anything much else. “Well, this is where I need to go,” I said to him, pointing to the name of the hotel and its address that I had written down on a piece of paper. Only when he stared blankly at it did I realize that even he did not speak or read or understand English. Getting off the car, I walked up to a woman in uniform, may be an airport volunteer. Perhaps the familiarity of the sounds that I uttered rang a bell in her. She walked up to the taxi and said something which immediately elicited a nod, a smile and a wave of the hand from the driver who beckoned me to hop in. Off we drove past the harbour bridge with its amazing pylons and cables of sheer steel that resembled its more famous cousin, the Golden Gate in San Francisco; the mesmerising views of the sea and the skyscrapers along its edge that seemed to rise out of nowhere amidst the clouds; the emerald coloured hills in the distance with their velvety looks; and finally the hotel. On the third day, on a train along the Orange Line from Hong Kong Central to the Disney Resort in Sunny Bay on Lantau Island, I did small conversation with a Filipino woman who spoke impeccable English. 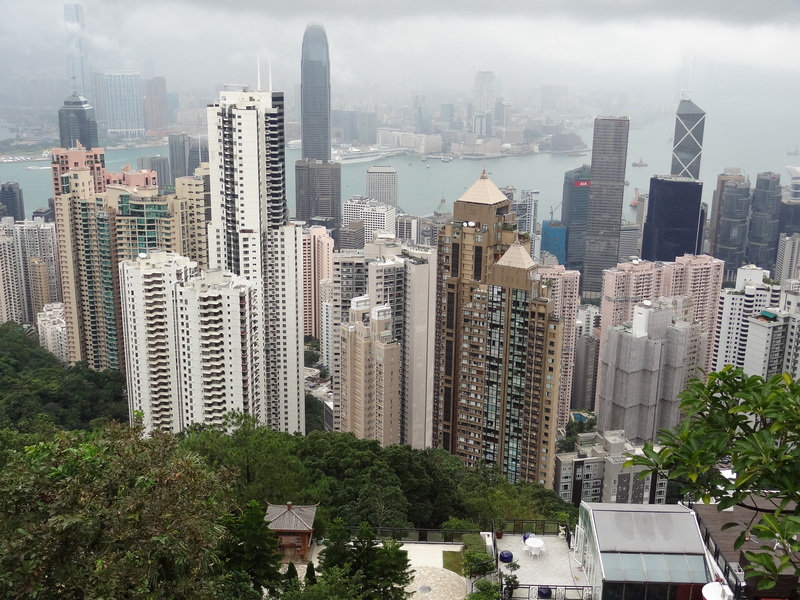 “Why don’t people in Hong Kong speak English all that much although the whole area was under the British for such a long time,” I ventured to ask. Yet Hong Kong is so much like legendary New York in parts. The mind boggling high rises; the million apartment blocks that have so many houses in them that the architects and the builders themselves seem to have lost count; the vibrancy, the power, the pace, the glitz, the showiness and the social electricity of Tsim Shat Tsui, the central business district; with its grand hotels, boutiques, restaurants, shops and showrooms that showcase the very best of the world’s fashion from clothes to jewellery to watches and shoes. Louis Erand, Rado, Ebel, Breitling, Tag Heuer and Rolex. A piece of the last named brand that I chanced upon was a diamond encrusted one with a whopping $ HK 3,56,000 price tag, the equivalent of a little over Rs 21 lakh! And then, Prada, Louis Vuitton, and Blvgari. The magnificence of Victorian grandeur amidst modern day razzmatazz. Bentleys, Ferraris and Lamborghinis zoom around as if they are regulation here. But in their showrooms somewhere in Hong Kong, I suspect, you better ask in Cantonese! This entry was posted in Issues and Ideas, Kannada & Karnataka, Literati and tagged Brahmins, Churumuri, Dalits, Hong Kong, Ramachandra Guha, Sans Serif, Sunaad Raghuram, The Telegraph, Tsim Shat Tsui. Bookmark the permalink. You can’t really compare HK with India. The social and cultural demographics are totally different. HK, China, Taiwan, Korea and Japan can afford to conduct business in their language because of several factors. First, there is one common business and state language, Cantonese (HK), Mandarin (China/TW), Korean or Japanese. Here in India we have no real common language except English, unless you want to be stuck in one state. This is a real practical problem. Second and more important, these are major centres of power and business. China can dictate terms to the world today. If you want to do business in Beijing you better speak Mandarin, because that’s the way things are *done* – there’s really no debate about it. People are comfortable about their language and culture. They don’t see a threat from English as perceive here on a daily basis where some group or other starts shouting about the evils of Tamil, English, Hindi, or some other language polluting our soil. Things are changing there as well. There are large numbers of younger generation east Asians learning English and other languages to be better able to work with western nations. If you want to compare, look at the other British colonies – Singapore or to a lesser extent Malaysia. Singapore speaks English, it was chosen as the official language for practical reasons. There are three distinct races and languages – Chinese, Malay and Indian (Tamil). Malaysia has a much larger percentage of Malays but the racial composition is similar. You see similar debates in Malaysia – reservation quotas, language for teaching and so on. However in contrast Singapore has chosen the more pragmatic approach – standardise on English, have one mother tongue in school and no debates about official languages. This is not to say the Singapore approach will work for all. It is a very small country that depends to a huge extent on foreign trade, so communication is key. India is very different, and we’re seeing debates similar to the Malaysia problems. The Philippines is very different. They speak Tagalog and English. They are not as powerful as HK/China but they exploit their use of English for business with other countries very effectively, and it has served them well. I guess what I’m saying in short is that there is no “one size fits all” approach. Each country or state needs its own strategy, but that needs long term thinking and a focused approach, which is absent here. For us, when we studied in middle schools in the 50s, we were taught only in Kannada. English was the first language. We studied it with Wren and Martin Grammar. Rest of the subjects were taught in Kannada only. Kannada medium was reigning supreme, and there was no English medium schools, which was a later introduction by the Convents. For those whose mother-tongue was Telugu, Tamil, or Malayalam, there were separate schools where the middle school education was in their mother-tongue. Only at the high school level, English medium choice was available. Those who intended to go to BE, MBBS or similar professional courses opted for English medium, while a large number preferred Kannada medium for their studies. Only at the inter-mediate level (PUC was introduced subsequently), one had to switch over to English medium and the teachers even at that level used Kannada to make the students understand the subjects better. What Dr UR says is correct – study up to the PU level should be in Kannada medium, with no scope for English medium with English as the first language. Only then onwards, the medium should be English. Dalit activists are right. I feel sorry for those people who study in government kannada medium schools. Just introduce english in these schools and these poor kids will improve their social condition. Now they are so cut off and it is like people knowing no english in India seems like a different species of human beings. Forget all these talk of mother tongue and spiritul roots. Spiritual roots is beyond language is what many indian religions teach. Do these budhijeevis really have any buddhi in them. How can they suggest Kannada medium. Do thier own children study in kannada medium. Narayan Murthy is right, english is the way to go – period. We cant compare with china, japan or germany. Who will write the science text books. Will URA or Kambar write them. Do they even have a viable plan. How will you keep in synch with the latest updates in science and technology. What will you do with learning kannada other than having the pleasure of reading books like ‘singarravanna aramanane’ and ‘samskara’ or ‘Ramayana Darshana’ or watching b grade kannada remake movies. The system in India is currently skewed heavily in favour of those who can speak fluent English. The prevailing system cannot be changed by groups of activists in small parts of the nation. Simply because the underclasses of India are not blind. They can see with their own eyes, that the ‘middle class’ of India shares one trait across the country – good knowledge of English. It is time people stop crapping against English education. We suffer from a sort of English disease. If English is not spoken, and not written, we feel, as if we may go back to Stone age. Even our elected representatives are also least bothered, whether our local language should exist or English should exist, there existence is very much important. Future of our country, survival of our culture, our language is not necessary. As long as we fight for supremacy of the local language or the state boundaries, or for sharing of Rivers, one nation, one language will be a topic for myriads of doctorates,PH D’s, workshops, seminars. The topic remains as a widely discussed subject, churning out millions of copies of papers. Let us take up China or japan, both of them never bother for English and they rule the world. Where as we look at them with admiration and worry whether we get a chance to establish a English Language Teaching center or a Language lab to earn our livelihood,let the one language concept dies. Jai Hind and Jai english. and they do business in english, no? and they advertise in english, no? and their currency has english, no? but how do you say the location and your destination in chinese??? The irish, scotts and the welsh have very distinctive and different mother tongues. their education is in english. now what Mr. ur ananthamurthy, why oh why they have not heard you. thats the whole problem, the abandonment of mothertongue is the most salient characteristic of a slave. the reason that the urban elite here lack originality is that they are using a foreign language that they are learning third hand. people in singapore speak english like crap and their thinking reflects that. they are a tiny city state making money on the most important strait in Asia. they are rich because they are diligent chinese and others are carrying the burden of producing culture for them to consume. a long term stategy is to cultivate one’s own language, bring the whole of human experience into it. Like imperial russia and french, it will take a few generations to fully switch, and meanwhile folks need to shed inferiority complexes. my parent’s generation was schooled in kannada, learned excellent english later in life, and bring their depth of experience only that language could have given them to all to all their endeavours. if you learn to speak english in India, with few exceptions, your english will never be good enough to be respected by the average native anglophone, no matter what politically correct pose they strike in front of you. one thing to remember, and know that millions need no convincing, kannada is more to important to them than hindi, than sanskrit or english, and more important than India. It is not something to be sacrificed at the alter of development. Or relegated to some language that mothers nag sons with to do their english homework. Living in bangalore and having some exposure doesn’t give one the faintest sense of kannada’s richness and breadth of dialects and qualities. Whether the challenge comes from the right wing saffron sanskrit-hindi promoting forces or from the leftist subaltern studies marxian post colonial dalit panther brigade it won’t matter, the exalted status of english in this state and nation is a temporary condition. lest someone think i am an outright chauvinist, i believe that urdu,tulu, konkani, kodava language and the border language people should be entitled to and encouraged to cultivate their mothertongue and that proportionate public funds should be provided to schools that aim to teach in those mediums. state education policy should be agnostic to language politics. this is a cultural struggle. India is a country with diverse languages and cultures. Whether the chest beaters like it or not, the nation needs a link language. And that link language will be English. The vast underclass of this nation is observing how English knowledge is differentiating the middle class elites from them. Those people want English, and no amount of moaning can change that. If you want to change that, ensure that technical publications are available in Kannada. Ensure that Kannada has a vocabulary to describe capacitors and CPU pins and USB ports. Above all, ensure that someone with a knowledge of only Kannada will be able to get a well paying job on the strength of his knowledge. And this is something that cannot be done. Time to accept that. Let the morons who do this chest beating start the project of translation of technical manuals instead of writing novels and poems. Like it or not, in the long term, Indians will be proficient in two languages – their mother tongue, and English. By protesting and screaming, you are just depriving millions of the chance to get out of the rut they are in. And it is time we begin to accept English as an Indian language. It will make the psychological aspect better. Regarding medium of instruction in schools, tarlesubba had convincingly argued (in praja.com) for a bilingual system wherein Science and Maths would be taught in English so as to keep abreast of the developments in these subjects abroad, but social studies, etc. would be taught in the local language so as to enable the students to familiarize themselves with cultural issues. May I request Churumuri reader Tsubba to present his views? Thanks. “The irish, scotts and the welsh have very distinctive and different mother tongues. Even the Chinese and Japanese have come to realize that their children need to study English. I recall reading in the newspapers back in 2000 and 2002 when the Chinese and Japanese Prime Ministers/Premiers had come visiting Bangalore/India about their desire to have English teachers from India to come to their countries to teach English to their children. i don’t agree that the nation needs a link language. it seems like the right thing to say, but actually, i believe quite the contraray is true. people who are emotionally vested in the project of nation building seem to say this a lot. if people know local language+ language of nearest neighbouring states, they’ll be fully suited to interact with their environment and be economically creative. the more local the language of governance the more local the governance. everyone would be better off with less central planning. couldn’t agree with you less about people needing to know about “cpu” and “usb port”, more than poetry and novels.regardless, technical manuals are actually some of the easiest things to translate. prosperity is not found on an accountants ledger. culture has the highest position in the value chain. people who code are subordinate to people who design, who in turn are subordinate to those who determine what is a social “need” . the difference between a fashion designer and a seamstress is that the former has cultural power and gets thousand times more pay for their time. the code-jockeys are the bricklayers and seamstresses of today and do not represent even the promise of prosperity. a people can be wealthy when they create their own desires, not borrow other’s. when you borrow, you are in debt to other people’s creativity. The obsession with IT and engineering education have done what for India? are we halfway to some greatness because of this? it cant even be said to have encouraged a scientific temperment in the masses..
I’m not even referring to central planning. Government and PSUs will contribute a miniscule small percent of the employment, as years progress. The private sector will be the main employment generator. India has 8-9 cities with lots of white collar job opportunities (Bangalore, Mumbai, Delhi/Gurgaon, etc.). One you get into a white collar job in the private sector, it is more than likely that you will travel between these 8-9 cities in the course of your career. As the years progress, more cities of this kind will come up in different parts of India. In general, movement across the nation will become a necessity. A link language is becoming more and more essential by the hour. And for purposes of work, English will be it. I did not say that “cpu pin and usb port” are ‘more important than poetry’. Both have their place. What I said was, first develop a vocabulary in Kannada, and the associated translated technical literature for the young kid in a village who aspires to go to Bengaluru and make it big someday. Let us face it – Indian languages don’t have any vocabulary for scientific and technical education. Such a vocabulary will have to be built, artificially. From the ground up. And no one will be willing to take up this task – our Budhijeevis pontificate to others about the virtues of giving up English in favour of local language, but don’t explain how the rural kid can make it big in contemporary India with knowledge of ONLY Kannada. You tell me, is it possible? Will you be honest enough to enrol your kids in Kannada medium and discourage them from learning English? As far as code-jockeys being today’s bricklayers is concerned… Let us remember that we are not the USA, or Japan, or Norway. We are India, where there are millions of people who earn a living by breaking bricks in the blazing sun. “Code-jockeys”, as you call them, are among the most privileged and financially well-off group of people in the country. And if you ask what “obsession with engineering and IT have done for India” – let me say this: today, India is at the best position economically, that it has ever been in the history of independent India. It was the retarded socialist policies that kept India backward for the initial years, perpetuating poverty. IT has brought massive good to India over the previous decade. As far as greatness is concerned, greatness will arrive with time. Let us not try to run before we can walk. For a nation that was bankrupt in the 1990s, and was in real danger of splitting apart due to insurgency and social problems, what we have today isn’t that bad. As manufacturing comes to India, as innovation begins to happen, as delivery of services and quality improves, we will move towards “greatness”. Let us get the basics right first, before aspiring for some “greatness”. Culture & language are independent entities. I can’t understand why our culture can’t be expressed in English. Likewise, I can’t understand why kids can’t learn both Kannada & English proficiently. @Nastika: Likewise, I can’t understand why kids can’t learn both Kannada & English proficiently. They can. For that we should remove the three-language policy wherein people have to learn Hindi (or some other language) also. What IT and engg. education have done for Karnataka at least is that hundreds of thousands of jobs are created. More than 50% of the revenues of the entire State comes from Bangalore alone. Engineering education is said to help one to learn structured thinking and scientific temperament. I would not like to get into this Kannada vs English debate but I have heard of several travelers mention the same issue that Sunaad faced. From what I know, most HongKongers have limited knowledge of English and Cantonese is required for communication outside the central business district. Till the 70s even though English was an official language, many Chinese were unable to learn the language due to limited educational facilities. Add to that the fact that much of the blue collar workers are from neighboring regions which may not have too much exposure to English. Many of the people working in transportation and hospitality sector are school dropouts and might not have studied in more than one language. Come to think of it, I have once seen people struggle with auto-rickshaw drivers at New Delhi railway station in explaining where they wanted to go as these drivers were from other states and had limited knowledge of Hindi. Of course this is an aberration but it can explain why such situations can occur regardless of a state’s language policy. Maybe introducing basic language courses for people in such professions can help. English for everybody. Savigannada for those who want it for whatever reasons–sentimental, cultural, even professional. I speak it because I am sentimental about it. Poorly taught English is worse than no English in rural areas. How is the author drawing conclusions on the prevalence of English in Hong Kong based on an old man and a cab driver? Old people and working class people in India also are probably not English-speakers, that says nothing about the prevalence or importance of English. – does teaching in the language spoken at home help children learn better/faster/more ? – is it possible to get an excellent education in schools which are not English-medium? – how much English acquisition is needed to improve outcomes at various educational levels? As far as I know the answers are yes, no and native-speaker fluency is really only needed at the most elite levels. I could be wrong, but these are empirical questions. is it news to people that most of the developed nations of the world do not speak english? furthermore, britain is not equivalent to western culture. in fact, many would have a much more nuanced take on the west if viewed without the anglo bias. India is in company with mostly sub saharan african nations in being dependant on this language. @vinay & shree kar, regarding the benefits IT economy and engineering focused education. first of all, as would be clear to many, the IT economy predominantly employs people not local to bangalore. there is nothing wrong with that per se, however, the average resident of the city has felt the enormous pressure of inflation because of this boom, far disproportionate to the benefits rendered in return by way of that tax revenue. If the city, district, or state had freedom to levy income tax on their own then perhaps the IT policy might make more sense to the local economy. on the contrary, that industry is on a tax holiday and have won the real estate lottery. this town has to beg the centre for basic amenities. its shameless really. furthermore, having had exposure to big IT companies in bangalore, i can say that more than 75% of software engineers at elite companies have remarkably poor english communication skills that no amount of training can fix. they speak with colleagues in indian languages and pidgin english. almost all of these guys have studied english medium and are from at least tier-2/3 cities. you don’t need english to code, in fact its the closest profession to being culture neutral. if some of these guys had a deeper understanding of their own culture, on a high literate level, they might be able to add value to their own communities. but they are all sub-literate because they can’t read any language on an adult level. exceptions are largely found amongst the usual suspects, bongs & mallus. What quality of english education will these government schools empart? when moneyed kids from outer extensions of bangalore studying english medium get ridiculed by people from “town” what chance in hell does a poor guy from a backward community in yadgir have? exclusion can’t be cracked that way. if every english teacher in the world moved to india, it’ll never work, and you’ll go broke. better and infinitely cheaper to bring the world to your own language. lastly, people on the thread have questioned what prospects a person has if they have not studied english medium. look around, the most successful players in the real estate, transportation/logistics, hotel, commodity trade, progressive agriculture, copyrighting and journalism conduct their work in local languages. they bring the extra confidence of knowing their roots and being street smart. the english kids dont have the street smarts to succeed outside of a few limited spheres like ITES. the current economic boom is nothing compared to the next which will be a race to win dominance over the domestic economy in every sector. the best and brightest will need to know how to write clever advertisements in telugu or design a kitchen appliance to sell to every third household in gujarat, or be a stategic consultant to a fishing company in kumta. all things that require local knowledge and language confidence. its a great time to sell on English, its utility is plateauing. Even today, the language of Corporate world in Chennai is one and only Tamil. English is spoken only with those people who doesn’t understand Tamil that too only in the initial years, later even the people who come from above Vindhya region will able to converse at least 10% tamil and they can able to understand basic tamil. But in Bangalore i have seen kannadiyans themselves converse in English mixed with little bit kannadam here and there. No need to learn from China or Hongkong, just take Brindavan express to chennai and visit some 2 or 3 companies then you will find the answer. While you are correct that most developed nations do not speak English, it is also true that the USA has dominated the 20th century. No nation in history has ever influenced mankind to such a great extent in such a short period of time. And the USA does speak English. As far as IT in Bangalore is concerned – as the years progress, every state will have its own “Bangalore”. Kochi, Ahmedabad, Kolkata, Guwahati, etc. There will be an influx of outsiders to each of these cities to fill up positions that are generated there. We will not be alone for long, do not worry. Already Mumbai, Delhi, Pune and Hyderabad are giving Bangalore good company. You refer to people involved in real estate, logistics, transportation, etc. But here is the point: all these people enrol their kids in English medium, and they all what their kids to grow up into the stereotypical middle-class-type English speaking jeans-wearing yuppie. The contractor who is building my house speaks broken English, but good Kannada, Tamil and Telugu, and a smattering of Hindi/Urdu. He is fairly well off, and has a couple of cars and lots of small sites in the outskirts on Bangalore. Now his daughter is old enough to be admitted into school. And he is not willing to settle for anything other than NPS or DPS or Kensree or some ‘International school’. All these people you speak of, who have made it big in real estate, transportation, etc. – all of them admit their next generation into hi-fi English medium schools. The more well-off they are, the more “hi-fi” the school will be. ok guys got your message. one question : what language should the flight attendants speak when you fly??? @m: I have yet to meet an English-mediums schooled person who is fully literate in an Indian language. comeon you are really farting now. we know madras very very well. can’t say the same about chennai. I vouch for Mr. Sankaran. He is right. We should learn from Tamilians how to love and safeguard our mother tongue, the language of the state. more recollections: the poor taffic copper in bengaluru who incidentally is educated in the best medium that is his/her mother tongue has to cope with vehicular number plates in tamil, telugu, malyalam, hindi and of course angreji. it’s got me thinking, that is scratching my balls…. the second one: i got a letter from the traffic police totally in kanada but the operative part that is the fine is in english. wow. effective dual language policy. and the best part is that the scooter is 15 years old my dughter used it till nine years back, i have no helmet, i have never used a scooter in bangalore, it is lying unused for nine years and I AM RIDING WITHOUT A HELMET. the dillema “cultured” parents from good families face, folks who don’t want to “sell out” to english is that kannada medium has become declasse. all the elite cultural capital has fled to the english camp. the reason english is privileged in this state is not because learning it has conferred huge advantages, (otherwise anglo-indians would be our overlords), but because traditional elites have patronized it. the vernacular language success stories who send their kid to english medium are doing it so that their children dont fall socially, not because of economic concerns. “m” also made a good point in observing that kannada medium kids often acquire full literacy in english later, but english medium kids almost never acheive that in mothertongue or hindi. the ability to read a novel with a certain ease. in a way, advanced literacy in ANY language is far superior to superficial familiarity with “important” languages. sort of how a solid foundation in mathematics makes understanding the physical sciences or economics much easier to understand, one need not re-learn analytical thinking from square one for each new subject. Kannada and other indian languages are grammatically and syntactical complex. that is why so many old timers who learned english late in life managed to use it so elegantly. they took for granted deep thought structures. unconciously, people who have poetic force in mothertongue are fit to become powerful communicators in any language. finally, i mentioned upthread that i don’t think the government should impose one or the other language on people as far as education choices are concerned. in fact, if their is a “back to mothertongue” movement among the elite and middle-classes, state intervention will only ruin it, politicize it somehow, and bring the requisite violence. so for the time being let people send kids to english schools, and often for good reason, but when some progressive educators get together and start a kannada medium school of the highest standards, i would say they deserve support and admiration and not dismissive remarks about how they are fighting a lost cause. or worse, robbing those kids’ chances of a better future…. Slums, ghettos, wealth inequality of the highest order, horrible infrastructure, non existent healthcare and basic amenities. and all we are bothered is how much of Kannada can someone speak? Boy, we have got some priorities. Build a country like HK that offers quality life, decent roads, public transport and then ask for respect for your language. Hongkong does not need to learn English because they have a population that can sustain itself. Europe does not speak English because they have people capable of building things ingeniously. We do not have it. Is it so hard to accept the truth? I live in a neighboring country (to HK) and been to HK a few times, there are quite a few Taxi drivers who can speak English, at least of a certain kind of accent. If not, you will find many who can read English (if you have a note). Most important of all, you do not get cheated and robbed. Taxi drivers do not wait for an opportunity to dupe a tourist. Honesty, that’s a language we need to learn. Other languages can wait. But then we have got other priorities and that shows. To all the mother tongue supporters can you please ask the people who create the various gov’t forms, to do so in simple colloquial mother tongue and not one which requires an MA to just fill a stupid application or at the very least provide a gov’t kannada to simple kannada dictionary in these offices to help the literate illiterates? BTW given the numerous dialects how to you decide upon the dialect before even thinking of using that as a medium of instruction? If you can make complete Kannada medium education attractive to the public and actually set up a world class Kannada medium school, I have no problem with it. You can promote whatever you wish to. I fear however, that mass initiatives of that kind will simply put the masses of our state even further behind. For the simple reason that you are trying to go against the natural flow with artificial intervention, in a very short time. seeing as how many people think that giving up their mother tongue in professional and civic life is a worthy sacrifice to progress, why not consider a smaller one. all indian languages agree on one script, probably the nagari or roman. it would facilitate cross-literacy and cooperation on a great scale. the written forms of the regional languages share so much vocabulary that many would be surprised to be able to scan the headlines of other language newspaper and actually make out the meaning. and so forth… seems like a small but worthy sacrifice. It is going to happen whether you like or not :) the more people become integrated and interact, the language will become a mixture of all the involved languages and more likely a least common factor of all the languages. Some might say this is how hindi evolved. Well that not a small sacrifice – its yet another totally impractical idea. Whoever does it will be father-figure to Tuqhlaq. Honestly that whole effort would amount to zero or even negative. Please think it over and lets hear something practical. In principle I am not opposed to common script, but frankly, I think it is very tough to implement. Basically, I think that trying to create something new and artificial and trying to ‘mould’ society to use it, is not going to be easy to implement. Some nitpicking, totally unrelated to the real issue. I would hope the ailerons were “activated” throughout the flight or the aeroplane might not have made it far past the departure point. What he saw were the flaps, and they are deployed not activated. @vinay – W.r.t your comment regarding coding and the english key words, I have an interesting experience to share. Probably you might have stumbled on something similar or not, I am not sure. ಮಕ್ಕಳ ಸಂಖ್ಯೆ ಕಡಿಮೆಯಿದೆ ಅನ್ನುವ ನೆಪವೊಡ್ಡಿ ಸರಿ ಸುಮಾರು ಮೂರು ಸಾವಿರ ಶಾಲೆಗಳನ್ನು ಮುಚ್ಚುವ ನಿರ್ಧಾರ ! ಕನ್ನಡದ ಮಕ್ಕಳ ಏಳಿಗೆಗೆ ಬುನಾದಿ ಹಾಕಬೇಕಾದ ಶಾಲೆಗಳನ್ನು ಒಳ್ಳೆ ಅವೆನ್ಯೂ ರಸ್ತೆಯಲ್ಲಿ ಅಂಗಡಿ ಇಟ್ಟಿರೋ ವ್ಯಾಪಾರಿ ರೀತಿಯಲ್ಲಿ ಲಾಭ-ನಷ್ಟದ ಕಣ್ಣಿಂದ ಅಳೆದು ಮುಚ್ಚುವ ನಿಲುವಿಗೆ ಬಂದಿರುವ ಸರ್ಕಾರ “ಸರಿಯಾದ ಕಲಿಕೆ ರೂಪಿಸುವುದು” ನಾಡಿನ ಮಕ್ಕಳ ಬಗ್ಗೆ ತನಗಿರುವ ಕರ್ತವ್ಯದಂತೆ ಕಾಣದೇ ವ್ಯಾಪಾರವೆಂಬಂತೆ ಕಾಣುತ್ತಿರುವುದು ಬರಲಿರುವ ದಿನಗಳ ದಿಕ್ಸೂಚಿಯೇನೊ ಅನ್ನಿಸುವಂತಿದೆ. ಕಿರಿಯ ಮತ್ತು ಹಿರಿಯ ಪ್ರಾಥಮಿಕ ಶಾಲೆಗಳು ಸೇರಿದಂತೆ ಸುಮಾರು ಮೂರು ಸಾವಿರ ಶಾಲೆಗಳನ್ನು ಮುಚ್ಚಲು ಸರ್ಕಾರ ನಿರ್ಧರಿಸಿದೆ. ಕಾರಣ? ಆ ಶಾಲೆಗಳಲ್ಲಿ ಮಕ್ಕಳ ಸಂಖ್ಯೆ 5ಕ್ಕಿಂತ ಕಡಿಮೆ ಇದೆ ಅನ್ನುವುದು. ಅಲ್ಲದೇ ಇತ್ತಿಚೆಗೆ ಪತ್ರಿಕೆಯೊಂದಕ್ಕೆ ಕೊಟ್ಟ ಸಂದರ್ಶನದಲ್ಲಿ ಶಿಕ್ಷಣ ಮಂತ್ರಿ ಕಾಗೇರಿಯವರು ಹೇಳಿದ ಇನ್ನೂ ಕೆಲವು ಮಾತುಗಳೆಂದರೆ “ಕೇಂದ್ರ ಸರ್ಕಾರ 20 ಮಕ್ಕಳಿಗಿಂತ ಕಡಿಮೆ ಇರುವ ಶಾಲೆಗಳನ್ನು ಮುಚ್ಚಬೇಕೆಂದು ಆದೇಶಿಸಿದೆ”, “ಕೇಂದ್ರದಿಂದಲೇ ಆದೇಶ ಬಂದಿರುವಾಗ ನಾನೇನು ಮಾಡಲು ಸಾಧ್ಯ?”, “ಇಂದು ಹಳ್ಳಿಗಳಲ್ಲಿ ಬಹಳಷ್ಟು ಮಕ್ಕಳು ಸರ್ಕಾರಿ ಶಾಲೆಗೆ ಬರುತ್ತಿಲ್ಲ. ಖಾಸಗಿ ಶಾಲೆಗಳ ಕಡೆ ಹೊರಳುತ್ತಿದ್ದಾರೆ. ಸ್ಪರ್ಧಾತ್ಮಕ ಶಿಕ್ಷಣ ವ್ಯವಸ್ಥೆ ಕಡೆಗೆ ಮಕ್ಕಳ ಮನಸ್ಸು ಒಲಿಯುತ್ತಿದೆ. ಇಂತಹ ಸಂದರ್ಭದಲ್ಲಿ ಈ ಎಲ್ಲ ಶಾಲೆಗಳಲ್ಲೂ ಮಕ್ಕಳಿಗೆ ಸರಿಯಾದ ಗುಣಮಟ್ಟದ ಶಿಕ್ಷಣ, ಸ್ಪರ್ಧಾತ್ಮಕ ಕೌಶಲ್ಯಗಳನ್ನು ಬೆಳೆಸಿಕೊಳ್ಳುವ ಶಿಕ್ಷಣ ಪೂರೈಸುವುದು ಸಾಧ್ಯವಾಗುತಿಲ್ಲ” ನೀವೇ ಯೋಚನೆ ಮಾಡಿ, ಪ್ರತಿಯೊಬ್ಬ ಮಗುವಿಗೂ ಶಿಕ್ಷಣ ಅನ್ನುವುದು ಮೂಲಭೂತ ಹಕ್ಕು ಅನ್ನುವ ಕಾನೂನು ತರುತ್ತಿರುವ ಈ ದಿನಗಳಲ್ಲಿ ಇಲ್ಲಿ ಕಡಿಮೆ ಮಕ್ಕಳಿದ್ದಾರೆ, ಅದಕ್ಕೆ ನಷ್ಟ ಆಗುತ್ತೆ ಅದಕ್ಕೆ ಮುಚ್ಚಿ ಇನ್ನೊಂದು ಕಡೆ ಹಾಕ್ತೀವಿ ಅನ್ನಲು ಶಿಕ್ಷಣ ಅನ್ನುವುದು ಲಾಭ-ನಷ್ಟದ ವ್ಯಾಪಾರವೇ? ಕಲಿಕೆ ಅನ್ನುವುದು ಸಂವಿಧಾನದ ಜಂಟಿ ಪಟ್ಟಿಯಲ್ಲಿದ್ದರೂ (ಸರಿಯಾದ ಒಕ್ಕೂಟ ವ್ಯವಸ್ಥೆಯಲ್ಲಿ ರಾಜ್ಯದ ಕೈಯಲ್ಲಿರಬೇಕಿತ್ತು !) ಅದರ ಹೆಚ್ಚಿನ ಜವಾಬ್ದಾರಿ ರಾಜ್ಯ ಸರ್ಕಾರದ್ದು, ಹೀಗಿರುವಾಗ ಕರ್ನಾಟಕದ ಮಕ್ಕಳ ಕಲಿಕೆಯ ಅಗತ್ಯಗಳ ಬಗ್ಗೆ ಏನೇನು ತಿಳಿಯದ ಯಾರೋ ದೆಹಲಿಯ ಯಜಮಾನರು ಆಜ್ಞೆ ಮಾಡಿದ್ದಾರೆ, ಅದಕ್ಕೆ ಮುಚ್ಚುತ್ತೀವಿ ಅನ್ನುವುದು ಮೈಗೆ ಎಣ್ಣೆ ಸವರಿಕೊಂಡು ತಮ್ಮ ಹೊಣೆಗಾರಿಕೆಯಿಂದ ನುಣುಚಿಕೊಳ್ಳುವ ಕೆಲಸವಲ್ಲವೇ? ಇನ್ನೂ ಮುಂದೆವರೆದು, ಸ್ಪರ್ಧಾತ್ಮಕ ಶಿಕ್ಷಣದ ಕಡೆಗೆ ಮಕ್ಕಳ ಮನಸ್ಸು ಒಲಿಯುತ್ತಿದೆ ಅನ್ನುವ ಮೂಲಕ ಸರ್ಕಾರಿ ಶಾಲೆಗಳಲ್ಲಿ ಅಂತಹದೊಂದು ಶಿಕ್ಷಣ ಕೊಡಲಾಗುವುದಿಲ್ಲ, ಅಂತಹ ಶಿಕ್ಷಣ ಬೇಕಿದ್ದರೆ ಖಾಸಗಿ ಶಾಲೆಗಳಿಗೆ ಹೋಗಿ ಎಂದು ಸರ್ಕಾರವೇ ಒಪ್ಪಿಕೊಳ್ಳುತ್ತಿರುವುದು ಎಲ್ಲ ವರ್ಗದ ಕನ್ನಡಿಗರ ಕಲಿಕೆಯ ಅಗತ್ಯಗಳನ್ನು ಪೂರೈಸುವ ಬಗ್ಗೆ ಈ ಸರ್ಕಾರಕ್ಕೆ ಎಷ್ಟರ ಮಟ್ಟಿಗಿನ ಬದ್ಧತೆ, ಯೋಗ್ಯತೆ ಇದೆ ಅನ್ನುವ ಪ್ರಶ್ನೆ ಹುಟ್ಟಿಸುವುದಿಲ್ಲವೇ? ಸರ್ಕಾರಿ ಶಿಕ್ಷಣ ಕಳಪೆ, ಖಾಸಗಿ ಇಂಗ್ಲಿಷ್ ಶಿಕ್ಷಣವೇ ಶ್ರೇಷ್ಟ ಅನ್ನುವ ಕೆಲವು ಖಾಸಗಿ ಮಾರುಕಟ್ಟೆ ಶಕ್ತಿಗಳ ನಿಲುವನ್ನೇ ಸರ್ಕಾರ ಪ್ರತಿಪಾದಿಸುವುದು ಕನ್ನಡ ಮಾಧ್ಯಮ ಶಿಕ್ಷಣದ ಸಮಾಧಿಯನ್ನೇ ಕಟ್ಟುವ ದಿನಗಳನ್ನು ತಂದೀತು. ಇದೇ ರೀತಿ ಸರ್ಕಾರಿ ಶಾಲೆಗಳನ್ನು ಬೇಕಾಬಿಟ್ಟಿ ಅಂಬಂತೆ ನಡೆಸುತ್ತ ಹೋದಲ್ಲಿ ಇವತ್ತು ಮೂರು ಸಾವಿರ ಮುಚ್ಚಿದವರೂ ನಾಳೆ ಎಲ್ಲ ಶಾಲೆಗಳನ್ನು ಮುಚ್ಚಿ ಬೇಕಾದ್ರೆ ಖಾಸಗಿ ಶಾಲೆಗೆ ಹೋಗಿ, ಇಲ್ಲ ಮನೇಲಿ ಬೆಚ್ಚಗೆ ಮಲ್ಕೊಳ್ಳಿ, ನಾವೇನು ಮಾಡೋಕಾಗಲ್ಲ ಅನ್ನುವ ಉಡಾಫೆಯ ನಿಲುವು ತಳೆದರೂ ಅಚ್ಚರಿಯಿಲ್ಲ. ಸರ್ಕಾರಿ ಶಾಲೆಗಳನ್ನು ಮುಚ್ಚುವುದು, ಇರುವ ಶಾಲೆಗಳನ್ನು ಮುಚ್ಚಿ ಹೋಬಳಿಗೊಂದು ಇಂಗ್ಲಿಷ್ ಮಾಧ್ಯಮ ಶಾಲೆ ಮಾಡ್ತೀವಿ ಅನ್ನುವುದು, ಪಾಲಿಕೆ ಶಾಲೆಗಳನ್ನು ಸಿ.ಬಿ.ಎಸ್.ಈ ತೆಕ್ಕೆಗೆ ದೂಡಿ ಧನ್ಯತಾ ಭಾವ ಅನುಭವಿಸುವುದು, ತಮ್ಮ ಸಿದ್ಧಾಂತವನ್ನು ಯಾವ ಯಾವುದೋ ರೂಪದಲ್ಲಿ ಶಿಕ್ಷಣ ವ್ಯವಸ್ಥೆಯಲ್ಲಿ ತೂರಿಸುವ ಪ್ರಯತ್ನ ಮಾಡುವುದು ಹೀಗೆ ಚಿತ್ರ ವಿಚಿತ್ರ ಪ್ರಯೋಗಗಳನ್ನು ಮಾಡುತ್ತಿರುವ ಸರ್ಕಾರದ ಕ್ರಮ ಮುಂದಿನ ದಿನಗಳಲ್ಲಿ ಕನ್ನಡ ಸಮಾಜದ ಮೇಲೆ ಮಾಡಬಹುದಾದ ಪರಿಣಾಮ ಎಂತಹುದು? ಒಂದೆಡೆ ಶಾಲೆ ಮುಚ್ಚಿ, ಹಳ್ಳಿಗಾಡಿನ ಮಕ್ಕಳ, ಅದರಲ್ಲೂ ವಿಶೇಷವಾಗಿ ಹೆಣ್ಣು ಮಕ್ಕಳ ಕಲಿಕೆಯ ಹಕ್ಕನ್ನೇ ಕಸಿದುಕೊಳ್ಳುವ ತೊಂದರೆ ಇದ್ದರೆ, ಇನ್ನೊಂದೆಡೆ ಒಳ್ಳೆಯ ಶಿಕ್ಷಣ ಬೇಕಾ ಖಾಸಗಿ ಶಾಲೆಗೆ ಹೋಗಿ, ಸರ್ಕಾರಿ ಶಾಲೆಯಲ್ಲಿ ಅದನ್ನು ಕೊಡಲಾಗದು ಅನ್ನುವ ಸಂದೇಶದ ಮೂಲಕ ಜನರು ಖಾಸಗಿ ಇಂಗ್ಲಿಷ್ ಶಾಲೆಗಳತ್ತ ಹೋಗುವಂತೆ ಮಾಡುತ್ತಿದ್ದಾರೆ. ಇದರ ನೇರ ಪರಿಣಾಮ ತಿಳಿಯಬೇಕೇ? ಸುಮ್ಮನೆ ಬೆಂಗಳೂರನ್ನು ಗಮನಿಸಿ. ಖಾಸಗಿ ಇಂಗ್ಲಿಶ್ ಮಾದ್ಯಮ ಶಾಲೆಗಳ ಸಂಖ್ಯೆ ಹೆಚ್ಚಿರುವ ಬೆಂಗಳೂರಿನಲ್ಲಿ ಕನ್ನಡದಲ್ಲಿ ಇಂಗ್ಲಿಶ್ ಬೆರಕೆ, ಕನ್ನಡ ಮಾತನಾಡದಿರುವುದೇ ಪ್ರತಿಷ್ಟೆಯ ಸಂಕೇತ, ಕನ್ನಡದ ಬಗ್ಗೆ ಕೀಳರಿಮೆ ಮುಂತಾದ ಸಮಸ್ಯೆಗಳು ಮಿತಿ ಮೀರಿ ಉಲ್ಬಣಿಸಿವೆ ಅನ್ನುವುದು ಏನನ್ನು ತೋರಿಸುತ್ತಿವೆ? ನಾಳೆ ಇದು ಇಡೀ ಕರ್ನಾಟಕವನ್ನು ವ್ಯಾಪಿಸಿದರೂ ಅಚ್ಚರಿಯಿಲ್ಲ. ಇಡೀ ಕರ್ನಾಟಕಕ್ಕೆ ಸಮಗ್ರವಾದ, ಅತ್ಯುತ್ತಮ ಗುಣಮಟ್ಟದ, ಎಲ್ಲ ಹಂತದ ಒಳ್ಳೆಯ ಕಲಿಕೆಯನ್ನು ಕನ್ನಡದಲ್ಲೇ ತರುವ ಹೊಣೆಗಾರಿಕೆಯನ್ನು ಸರ್ಕಾರ ಹೊರದೇ ಹೋದರೆ ಆಗುವ ಕೆಟ್ಟ ಬದಲಾವಣೆಗಳು ಎಂದಿಗೂ ಹಿಂಪಡೆಯಲಾಗದ ( irreversible) ಬದಲಾವಣೆಗಳಾಗಲಿವೆ. ಒಂದಿಷ್ಟು ಜನರಿಗೆ ರಾಜ್ಯೋತ್ಸವ ಪ್ರಶಸ್ತಿ ಕೊಡುವುದು, ಮಾಣೇಕ್ ಶಾ ಮೈದಾನದಲ್ಲಿ ಒಂದು ಕಾರ್ಯಕ್ರಮ ಮಾಡಿ ಸಿಹಿ ತಿನ್ನುವುದು, ಆಮೇಲೆ ಕನ್ನಡ, ಕನ್ನಡಿಗರ ಉಳಿವಿಗೆ ತಾವೆಷ್ಟು ಬದ್ಧ ಎಂದು ಭಾಷಣ ಕೊರೆಯುವುದು, ಕಲೆ, ಸಾಹಿತ್ಯ, ಸಿನೆಮಾ ಅಂತ ಬೊಕ್ಕಸದಿಂದ ಒಂದಿಷ್ಟು ಹಣ ಕೊಡುವುದೇ ಕನ್ನಡದ ಕೆಲಸ ಅಂದುಕೊಂಡಿರುವ ಈ ಸರ್ಕಾರ ನಾಡಿನ ನಾಳೆಯನ್ನು ರೂಪಿಸಬೇಕಾದ ಕಲಿಕಾ ವ್ಯವಸ್ಥೆಗಳತ್ತ ಇದೇ ಕಡೆಗಣನೆ ಮುಂದುವರೆಸಿದರೆ ಕನ್ನಡ, ಕನ್ನಡಿಗನಿಗೆ ಉಳಿಗಾಲವಿಲ್ಲ. ಕೊನೆ ಹನಿ: ಉದ್ಯಮಿ ಅಜೀಂ ಪ್ರೇಮ್ ಜಿ ತಮ್ಮ ಫೌಂಡೇಶನ್ ಮೂಲಕ ಎಲ್ಲ ರೀತಿಯ ವ್ಯವಸ್ಥೆಯುಳ್ಳ ಎರಡೆರಡು ಶಾಲೆಯನ್ನು ಎಲ್ಲ ರಾಜ್ಯದ ಪ್ರತಿ ಜಿಲ್ಲೆಯಲ್ಲೂ ತೆಗೆಯುವುದಾಗಿ ಘೋಷಿಸಿದ್ದಾರೆ. ಅಷ್ಟೇ ಅಲ್ಲ ಈ ಶಾಲೆಗಳಲ್ಲಿ ಆಯಾ ರಾಜ್ಯದ ಸ್ಥಳೀಯ ಭಾಷೆಯಲ್ಲೇ ಕಲಿಕಾ ವ್ಯವಸ್ಥೆ ರೂಪಿಸುವುದು ಮತ್ತು ಅದನ್ನು ರಾಜ್ಯದ ಬೋರ್ಡ್ ನೊಂದಿಗೆ ನೊಂದಾಯಿಸಿಕೊಳ್ಳುವ ಅತ್ಯಂತ ಸಂತೋಷದ ನಿಲುವು ಪ್ರಕಟಿಸಿದ್ದಾರೆ. ನಮ್ಮ ನಾರಾಯಣ ಮೂರ್ತಿ, ಕ್ಯಾ.ಗೋಪಿನಾಥ್ ಅವರು ಇದನ್ನು ಗಮನಿಸುತ್ತಿದ್ದಾರೆ ಅಂದುಕೊಳ್ಳುವೆ. ಇಂತಹ ಕ್ರಮಗಳು ಹೊಳಪು ಕಳೆದುಕೊಳ್ಳುತ್ತಿರುವ ತಾಯ್ನುಡಿ ಶಿಕ್ಷಣದತ್ತ ಎಲ್ಲರೂ ದೊಡ್ಡ ಮಟ್ಟದಲ್ಲಿ ತಿರುಗಿ ನೋಡುವಂತೆ ಮಾಡಲಿ ಆಗಲಾದರೂ ಸರ್ಕಾರಕ್ಕೆ ತನ್ನ ಹೊಣೆಗಾರಿಕೆ ನೆನಪಾಗುವುದಾ ನೋಡೊಣ. ಇಂದಿನ ಮಕ್ಕಳೇ ನಾಳಿನ ಪ್ರಜೆಗಳು ಎಂಬ ಸತ್ಯದರಿವು ಇರುವ ಮಕ್ಕಳ ಸರ್ವಾಂಗೀಣ ಬೆಳವಣಿಗೆಯತ್ತ ಪ್ರೇಮವಿರುವ ಪ್ರೇಂಜಿಯವರ ಸಂತತಿ ಸಾವಿರವಾಗಲಿ! ಇವರ ಶಾಲೆಗಳು ಚೆನ್ನಾಗಿ ನಡೆಯುವಂತಾದಾಗ ಅವುಗಳನ್ನು ರಾಷ್ಟ್ರೀಕ್ರತ ಮಾಡುವಂತಹ ದುರ್ಬುದ್ಧಿ ನಮ್ಮ ರಾಜ ಕಾರನಿಗಳಿಗೆ ಬರದಿರಲಿ! They’ve got to be kidding if some feel hindi emerged after evolving out as the least common factor of all Indian languages that interact with one another. What those people could instead be referring to is the hindi-imposing policies that the Indian union govt. has continued to make which has not only created this illusion around Hindi, but also as a fallout of such stupid policies, schools in various states have now ended up teaching three languages – state language, english and hindi. The place occupied by Hindi could easily be replaced by any language of a neighboring state and that’d have been a far more useful scenario, not to mention of course the inter-state brotherhood that would have catalyzed. In your comment (“India has 8-9 cities with lots of white collar job opportunities…. A link language is becoming more and more essential by the hour. And for purposes of work, English will be it.”) the only bug I see in your argument is in calling such a language that benefits such city-hoppers as the link language of a nation whose village/city ratio is perhaps still in the thousands. Its a link language of those city-hoppers, for heaven’s sake, not of the nation! This disproportionate magnification of the purpose of one language, usually to the national level, needs to be challenged. In fact on your lines of reasoning the truck drivers passing by 10-15 cities of India will need their own link language too. Will we be able to accept that as the next link language of the country? Likewise. Language used for communicating is a choice people make based on practice and convenience. There’s no need to formally announce one language as the link language of a particular people, especially one that is as linguistically diverse as the Indian population. i like your point about inter-state brotherhood being encouraged by learning a different third language. its sad to see that in belgaum, sangli, kolhapur how much hindi has gained at the expense of kannada and marathi because people no longer learn the language on the other side of the border OR are too antagonistic to speak the other language (although they know it perfectly well). because of this cleavage, folks are getting out of touch with how much heritage they share with each other. i understand if a kannadiga and bengali use hindi as a link language, but for neighbouring states this is sad and unneccessary. its also dangerous in the long run that the nation’s cultural relations will be brokered from the north. Let us take example of Mainland China where Mandrin is a common language and each province has its own dialect. But since they use a common script, language imposition issue doesn’t arises. So when two different provice people meet each other, they converse in mandarin and script is same across china. But this cant be taken as a model in India, because each region has its own language and well defined script. There is no point of making hindi as a common language in India. Even if we consider of making hindi as a common language, the hindi will consume all the south indian languages within no time. Link language should be english which will help people to grow globally also. Today Guru Nanak’s Birthday was celebrated. The Major Majority : who is guru nanak??????? It would be incorrect to ‘assume’ that hindi would be a reasonable choice as link language between a Kannadiga & a Bengali. In this case either Kannada or Bengali would be the link language. Which one is decided by the context, the nature of transaction, and the two individuals/organizations involved. Hindi is the link language for the Hindi-imposed; for those who believe their own languages cannot play that role for the intended purpose even though it could. This unwanted proxy called Hindi warrants removal from our minds that have repeatedly been programmed to believe Hindi as a link between any two beings in this country. @Rohith, learning neighboring language is brilliant plan. Any language must be taught on different ‘Level’ basis. Level 1 would focus on speaking, Level 2 on more speaking and basic writing 7 so forth. Level 10 can be ಪಂಪ, ರನ್ನ & ಹಳೆ ಕನ್ನಡ. So even a class 8 student who Kannada will join Level 1. This will ensure even a person who is on Karnataka for 1 year will have working Kannada speaking knowledge. Link language within Karnataka will be Kannada. This requires flexibility in thinking & implementation. the dillema “cultured” parents from good families face, folks who don’t want to “sell out” to english is that kannada medium has become declasse. No, I don’t think it just about declasse. I think there is a lack of excellent schools which teach in Indian languages. I would like to send my kid to a school that is the equivalent to Doon School but the medium of instruction is an Indian language, but where does this exist? @the colonel, I said “fully literate,” so your family speaking would not prove anything. Fully literate means can read works for educated adults — intellectual journals, non-fiction etc.